Friedrich's Man and Woman Contemplating the Moon(1830-35). The emotional communion between people and nature is a long standing theme in art, extending deep into antiquity. This work is on display at the Alte Nationalgalerie in Berlin. 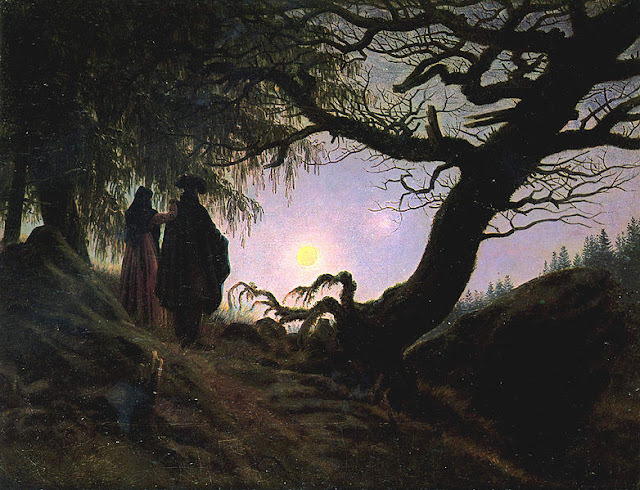 German Romantic painter Caspar David Friedrich (1774-1840) is an artist whose work has the ability to inspire creativity, as well as divide opinion. Many descriptions of his work seem to focus on their contemplative nature as a precursor to the anxieties that would plague later artistic movements. One of the most well known recollections was French Sculptor David D'Angers' description of his work as a "tragedy of the landscape" - highlighting the ability of Friedrich's atmospheric pieces to produce a strong emotional resonance. What was interesting to me was the notion of artists like Friedrich being anti-classical. Some like to extrapolate a social commentary from Friedrich's work. Indeed in the 1930s the Nazis used to reference Friedrich's work as iconocially German. Like with any creative endeavour however, an artist's visual language is not merely influenced by their own personal experiences, but build upon visual traditions of the past. Looking at Friedrich's amazing ambience, despite the absence of clear iconographical markers of classical themes, one can not escape from the parallel to past artists equally entranced by the mystical landscape. The controversial Il Tramonto(1505), an evocative landscape that drips with Giorgione's reverence of nature, though the attribution is still contested. This painting is housed at the National Gallery London. Much has been said about the influence of Venetian master Giorgione on landscape painting. 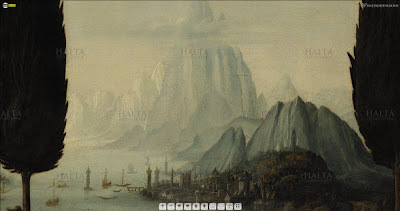 Whilst he was not the first Italian artist to depict the landscape, he did imbue it with a sense of magic and mystery that was to permeate the ages, influencing not only a band of contemporary followers, but onward in time to artists such as J.M.W Turner, Friedrich and even the Pre-Raphaelite Brotherhood. 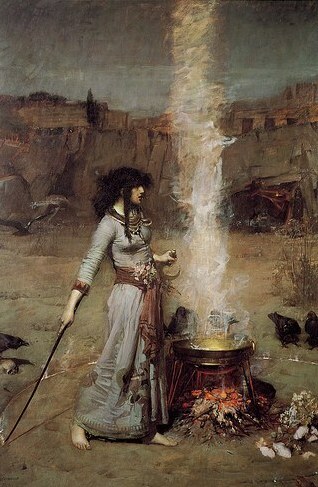 The Magic Circle(1886) by Pre-Raphaelite painter J.W Waterhouse - This often overlooked marvel conjurs a deeply mystical ambience, accentuated by the depiction of the primordial landscape in the background. This 'mystical landscape' is not anti-classical at all, and in fact has its roots in the writings of antiquity. 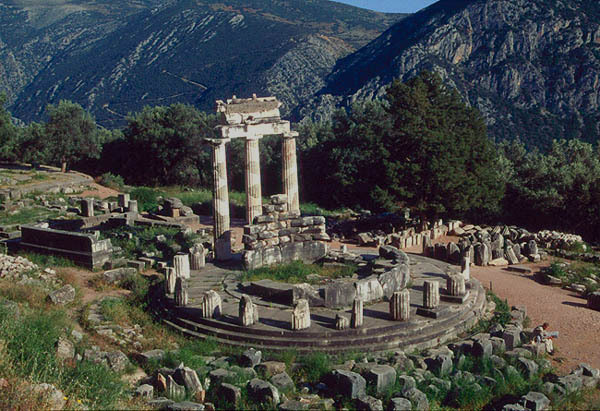 What greater symbol of this mysticism is there than the Oracle of Delphi? A prominent site in antiquity for over 1000 years, it was an earthly realm of the divine, a place where mortals could commune with the Gods in seeking answers to questions plaguing their lives. 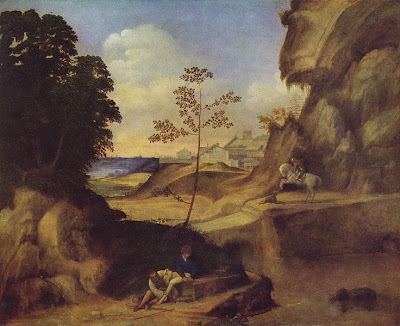 As Giorgione extrapolated on the Renaissance adaptations of classically inspired pastoral works, such as poet Jacopo Sannazzaro's(1458-1530) Arcadia, Friedrich repurposed the imagery of his native Baltic into a landscape of reverence and contemplation. His images are as much a Germanic version of Arcadia as Giorgione's works are of Italy. Despite the absence of classical motifs, the reverence of nature as a divine power dwarfing the human soul is something that will always echo through time. Turner's Snowstorm: Hannibal and his Army crossing The Alps(1812) is an awe-inspiring landscape painting. 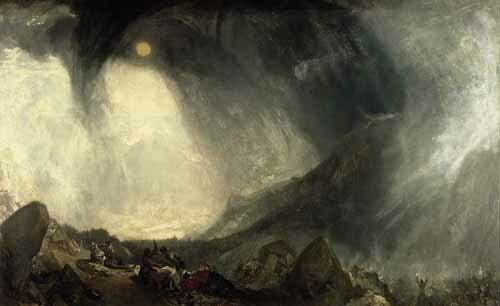 Due to his depiction of themes and scenes from antiquity, Turner's classical influences are much easier to cite. I believe this dimension of Friedrich's work is not sufficiently explored. Other seem more intent on associating his work with the emotional gravitas of later artists such as Edvard Munch(1863-1944) and Mark Rothko(1903-1970). This influence is of course present, but there is also something deeper and primordial churning underneath, which parallels beautifully with themes from antiquity and the Renaissance. Thanks for an excellent post. I really enjoyed the video clip although I think he goes a little overboard sometimes in his interpretive remarks. You might enjoy the following quote from Enrico dal Pozzolo's "Giorgione" on the origins of landscape.
" It is commonly known that many of the connections made in Marian hymns…between natural elements and the figures of Mary and Jesus actually contributed to the development of landscape in religious Veneto painting…." p. 272. Simon Schama is pretty melodramatic, even going to the lengths of dramatising sequences in his documentaries - but it adds to the fun. His 'power of art series' is phenomenal - especially the Caravaggio and Bernini episodes - which I have posted clips of before. This is an interesting argument, and I can see what you're saying to some degree. I think the thing which differentiates the Romantics between the classicists is there interest in the sublime (the inexplicable, awe-inspiring power of nature). I feel like Renaissance artists and classicists were often more interested in understanding and rationalizing nature (which can be seen in their harmonious, balanced landscapes). On the other hand, Romantic artists often emphasize the inexplicable sublime through drama and tension in their art. This drama and tension is not only seen in subject matter, but also formal elements like diagonals in composition, color contrasts, etc. Giorgione is a good Renaissance example (perhaps the best example?) to bring up, especially one could argue that a similar interest in nature (and perhaps even a bit of the Romantic sublime) can be seen in his painting "The Tempest." I also think that you've brought up an interesting idea about the Oracle of Delphi. I never considered that before! I suppose one could argue that this is an early interest in the romantic concept of "the sublime," too. Cheers for the nice comment M! As you know, I love to look for common themes spanning many eras. Sometimes these themes are suggested by symbols, but I'm finding I'm becoming more sensitive at catching patterns in the way authors, critics and commentators like AGD choose their words. It's often similarities in the descriptions they use that sets off a new train of thought. This experiential way of looking at things interests me much more because it strikes at why particular works appeal to us and why similar themes are perpetuated through time. Nature is indeed one of those 'timeless' subjects. After reading Frank's comment, it really struck me that I should go back in and mention Leonardo as well. After seeing his 'Annunciation' earlier this year, if the background in that is not a precursor for the misty landscapes of the Romantics, then I don't know what is! The same applies for the Madonna of The Rocks, even the background of Mona Lisa to an extent. We can equally see it filter forward in time - even to the surrealists, with Dali's dream landscapes coming to mind in particular. Fascinating to behold, the subtle progressions of the human fascination with the mysteries of nature. You're absolutely right to look for the connections. For instance, a form, ie a shape, carries meaning. (The Greek word for form was "idea".) Thus, if a later artist uses a figure from an earlier artist in his new work, the new figure carries with it some of the meaning from the old. That is one way that looking for connections is useful and exciting but there are many others. Good work! Keep it up. There's much that outsiders can see that academic insiders never will. Cheers for the great feedback S!